Select the Month and Year to display in the calendar below. If any of those dates have a House Session Audio associated with it you will see the day appear in red. 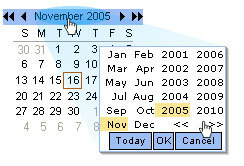 Clicking on the day will display a new page with all of the audio files listed for that day. Notice: Session Audio Archives are available for February - May/June for years 2004 (only February) and 2005 to 2009. There will be no audio archives after 2009 as we are moving to video starting in 2010.